Reformation Day is an important liturgical festival that is celebrated by Lutherans and Christians of many Protestant denominations. 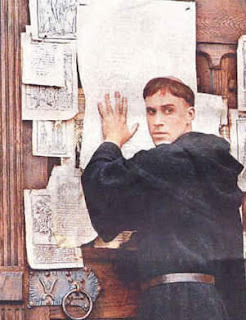 It commemorates Dr. Martin Luther's posting of his Ninety-five Theses on the door of the Castle Church in Wittenberg, Germany on October 31, 1517. This act triggered the movement in world history known as the Reformation. While the historical date for the observance of Reformation is October 31st, most churches celebrate it on the last Sunday in October. For more information on Reformation Day go here or here! Happy Reformation Day, dear kindred spirit!